Walking in the streets of Istanbul, I am frequently greeted by strangers with “as-Salaamu ‘alaikum” as they pass. If you go outside with small children, you very quickly realize that Turks assume a sense of collective responsibility for them. You will never lose a mitten or a baby shoe, because inevitably someone will notice that it has been dropped, and either tell you, or bring it to you. Exclamations of “masha’Allah” come from passersby as they dote over your babies, whether old men, women in flowing abayas, or girls in t-shirts and jeans. I have lived in the Muslim world for a third of my life, and been in many Muslim countries, and I have never seen a society that is as fundamentally decent as Turkey. 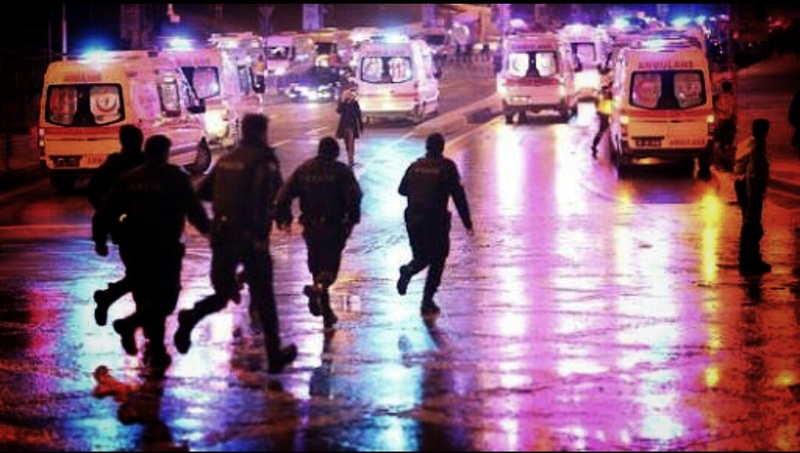 Last night a suicide bomber blew himself up outside a stadium in Taksim, Istanbul, followed in less than a minute by a second blast; nearly 30 people were killed, and 166 injured. Whenever something like this happens, I always find myself thinking about what both the victims and the perpetrator were doing a few hours before; they woke up, dressed, ate, talked to friends and family, laughed, noticed things, had thoughts, feelings. It does my head in. Someone they made smile in the morning was screaming about them a few hours later, weeping, praying for their safety. And whoever carried out the attack; were there not hundreds of things permeating his senses that should have made him change his mind? Things that should have awakened his reason, his human compassion, his desire for another path in life? How can you believe your “cause” is right (whatever it is), if you have to shut these things off in your heart and mind, or in the hearts and minds of your followers and supporters? If you are right, why do you have to brainwash anyone and dehumanize them so much that they dehumanize others? As of my writing this, no one has claimed responsibility for last night’s attack. The usual suspects, of course, will be the PKK, Da’esh, or the radical communists. They take turns knowingly or unknowingly serving the West’s agenda to destabilize Turkey. They have proved to be incapable of noticing that these tactics have never positively benefited their own “causes”, and never will. These groups, and I think, the West, have not understood the greatest lesson from the July 15th coup attempt. The Turks assume a sense of collective responsibility for their society; just as they do for small children in the street. Whatever differences some may have politically with the government, they are generally unified when it comes to the country’s stability. Any opposition group should learn from this. When any group resorts to dramatic acts of violence, it revels their weakness and their inability to convince anyone to support their objectives; it is an attempt to blast their way out of the margins, but it just marginalizes them even more. If you want your cause to succeed, you cannot do it by a process of dehumanization. You need to build connections between your group and the general public, not sever them. Help them, don’t harm them. Empathize, don’t dehumanize. Don’t turn your group into cold-hearted, brainwashed automatons serving their leaders; but rather compassionate, intelligent servants of the community. And if you cannot do that without it detracting from your “cause”, then you should recognize that your “cause” is wrong.